Super Hero Boy: Looking for a last minute gift for the gamer on your list? Looking for a last minute gift for the gamer on your list? There is one game on the market right now ready for your last minute shopping list that I can tell you hands down that if you have a dad or guy to buy for on your Christmas list, he will scream like a little girl when he unwraps it! What game is this you ask? Well that's simple : Call of Duty World at War. I need to warn you though Call of Duty is for adults only. Meaning it does feature violence, blood and guts, and other adult contact that is just not suitable for children. Call of Duty World at War like the other Call of Duty games is quite possibly the most realistic shooting game you can buy. I've watched the boys (aka my adult male friends) play it several times and I am just blown away at just how graphically advanced it is. Every detail is accounted for from the hairs on the players heads to the details on the vehicles and weapons. If your looking for a game that will really take advantage of all of the graphical capabilities of your game system this is most certainly the game for you, with that said I didn't notice any lag while playing this on the WII or the PS3 though just from the capabilities of each system the picture is better on the PS3 version, not that's of any fault to the Wii the PS3 just has a far better video card. Call of Duty World at War is fast paced, and tons of fun on single player mode but really the beauty of this game is and always will be the mutliplayer functions as no Call of Duty is complete without spending hours and hours shooting your buddies in the head. Call of Duty is not for the casual gamer. Its an absolutely gorgeous game, but the game play is brutal from watching people getting tortured to hearing the characters scream when you shoot them while they are spurting blood. Set people on fire with your flame shooter, stab them if they get too close, or practice your sniper shots. Again people this is not the game for kids but dad's everywhere are already foaming at the mouth. Call of Duty World at War is available on almost every platform including the PS3 which personally I think the game plays and looks best on, to your PC, and of course the Wii. Which really makes me debate just which system is the most fun to play. If graphics are your thing I'd say definitely go with the PS3 or PC editions but the Wii functionality of using the controller as your gun really takes the cake as it has been my very first shooter game for the Wii and it makes an already challenging game ever more challenging not to mention incredibly fun. Playing head to head on the Wii is also great fun and will leave the guys howling for more. I know what I will be wrapping for the guys in my life on Christmas. You guys should go and check it out too. Call of Duty World at War is rated mature and is for players 17 and up. You can read more about Call of Duty World at War at its website or purchase your own copy on Amazon! 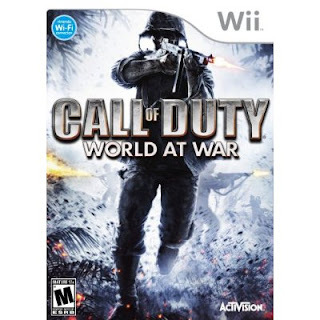 I have a copy of Call of Duty World at War for the Nintendo Wii to give away to one lucky winner! Leave a comment on this post. Check out Call of Duty World at War and tell me what is your favorite guy friendly video game of all time! My husband would flip for this. Another guy friendly game is Halo3. The best guy-game of all time is Super Tecmo Bowl for the Nintendo Entertainment System. I guess this video is guy friendly because it is mine and my husbands favorite - "Laura". I love the Ratchet and Clank series. I know my son loves Transformers game, my other son loves any Halo game & my hubby loves anything sports related. I would love to win this for my brother in law. I know that his favorite guy friendly game is Zelda. Thanks for the giveaway! I would have to say Halo, all the guys in my life play it. My son Tyler loves the Medal Of Honor games. Any of the Madden football games.. The game that my son and I find ourselves going back to over and over is Civilization II for the PC. my son likes all the EA Sports games and also Metal of Honor and I think he'd love this one too! both resistance games! awesome games! Our favorite Guy Friendly video game of all time would have to be the Grand Turismo series. We got pretty competitive in this house while playing that game, but it was a blast too! My Hubby loves the Call of Duty games, but that one is more for him. The original Metal Gear Solid for Playstation...classic! Thanks so much for this giveaway. Battlefield Vietnam is my husband and his friends favorite. Thanks and Happy Holidays. All of the Call of Duty games are guy friendly. Nothing helps you unwind from work like killing people. I play Grand Theft Auto and thought it was a hoot! My DH really likes EverQuest 2 and the Grand Turismo series of games. Resident Evil is very guy friendly. My hubby loves to play the WWE Smackdown VS Raw! I'm a subscriber! Thanks again!! smackdown vs raw... wwe games are awesome. So's this giveaway. I think my favorite would have to be Resistance: Fall of Man. my husband like to play mario kart. i think he even beat the game and still he plays.... lol! Halo 3. Thanks for your giveaway! Thanks for the giveaway! My son loves Pokemon and Football games. I think the best guy friendly video game would be the original Grand Theft Auto. Thanks for the chance. The guys in my family love Mario Kart-but so do I! Thank you! DH is a big fan of Halo 3. thanks! Guitar Hero is the fav of the younger guys in my family. My favorite is "I was an Atomic Mutant". It was great being the monster and destroying the towns. A boy's fantasy come true. Bass Pro Hunting. I play it with my husband sometimes just to beat him! Another one is Tomb Raider. I think it was for Nintendo, but not the Wii. I am going to have to say "Madden Football"
I don't know about "guy friendly" but this Call of Duty looks good. Astroids for the old Atari-an nice shoot-em-up game for guys! My husband is currently obsessed with Fallout 3. My husband would love this game. We also love Star Wars too. Thanks. Bob's favorite games tend to involve shooting and either Nazis or zombies. Call of Duty would appeal to his WWII fetish, I think! My husband would like this. His favorite guy friendly game would be hands down world of warcraft. Any of the Halo games. Hubby had to have a Xbox 360 just for the new one. The Madden football games have to be it. My husband says the best game for guys is any of the Ghost Recons. I must admit that I enjoy the strategy part playing the game with him. i love gears of war! Any game in the Zelda series. This game looks awesome. I have played all other Call of Duty games (all great). I also enjoy Gears of War. My husband has almost worn out Madden, he plays so much. My husband loves the Spore game for the PC. My husband would love to have this. My favorite guy video game is Flight Simulator. My son loves this game and we rented it and he wants it for Xmas!!! Favorite guy friendly game is Need for Speed!! Grand Theft Auto is definitely a guy friendly game (and a parent's nightmare!) Thank you for the great give-away. Need for Speed is my favorite guy game of all time! Testosterone - gotta love it! I just subscribed for your emails! This is such a guy game! My Husband and son would love this game! Thanks! Guitar Hero and Medal of Honor for sure are guy friendly games! civilization is what my husband plays. so im gonna say that. Grand Theft Auto #4 is a good one I hear. My son has been wanting this prize. Also he asked for fall out, Elder Scrolls, madden 09 and of coarse halo. Thank you for the chance to give to someone I love. Oh my "boys" 28 & 25 would LOVE this game. Right now their favorite game is Red Faction. They play it against each other over the computer every night and play on the playstation every time they are at the house. Santa is bringing a Wii for the grandchildren so I am sure they will have just as much fun with it LOL. They like Guitar Hero and Rock band but the football Madden games are good too. Only THE Most Guy friendly game OF ALL TIME! My favorite Guy Friendly video game of all time would have to be the Madden football! Oh my son just loves playing the Call Of Duty games. Another guy friendly game for him is the James Bond 007: Quantum of Solace. My favorite guy friendly video game of all time is Grand Theft Auto. My husband is playing House of Dead 3 right now, so I guess that one is pretty guy-friendly- thanks! My favorite game to play with hubby & his soldiers is Guitar Hero. I love rocking out on it! My sons love Guitar Hero. My boyfriend loves Oblivion and i actually like watching it. The graphics (on the Xbox 360) are pretty amazing especially on his new big screen TV. I personally am more of the Tetris type...it's even better when I can get him to play! My favorite guy friendly game is Unreal Tournament 2003. Thanks for the contest! I am subscribed to your RSS feed through bloglines. I know its terrible, but the Grand Theft Auto series is just soooo much fun to play! My dh and ds both love nascar games and the all time fav guy game in my house is Madden. We're a football family. son loves zelda and billy loves sonic! I'm not a guy, but my husband's favorite video game is Bowling on Wii Sports. My son and fiance love this game when they rent it, they would love to have it!! Star Wars The Force Unleashed is a good guys game. Great giveaway. My hubby would LOVE this! right now he's into Quake 4. Believe it or not, my husband loves playing Lego Star Wars with the boys! Thanks for the great giveaway. The Resident Evil series. Guy friendly and it's one of my favorites too. My husband and his friends play Halo. The guys around here say it's Halo. Diablo. Oh my before World of Warcraft, which is the new in, Diablo was the game to play. Now of course it's WoW. Best guy friendly game has got to be the GTA series. Thanks for the giveaway...favorite guy friendly video game of all time: The original Pong, circa 1979... um, I mean Halo 3. My husband and son love playing Age of Empire (good stragedy game). My hubby has the Call of Duty for the Playstation, and I am sure he would love to get the one for the Wii! More action, more fun! Guitar Hero seems to have pulled together guys more than other at-home video games that I can recall. my husband absolutely loves this line of games! they are by far his favorite!! this would make a great bday/vday present for him! thanks for the chance!! i love first person shooter games, would love to win this this :) another good one is Halo 3 ! My husband really wants this. He has really enjoyed Tom Clancy's Rainbow Six for our Gamecube and is looking for something great for the Wii. Well, my husband loves each and any soccer game of which we have like at least 5. So, I guess they are pretty inocuous. My favorite is Halo 3, enter me please. guy friendly? only one? thats tough. I will say metal gear solid. no.. gears of war.. I cant choose just one. My vote is for Halo! the suffering is my hubbys fave! My husband would love this. Tiger woods Golf 2008. The guys in my family play the Madden Football games. They always have to get the newest one out. Back then and now we always like combating in the Twisted Metal games. Please accept my entry. Thank you. My teen son would probably say Halo. OMG my hubby would freak out!! I would have to say halo! Great giveaway! My vote has to go to Metal Gear Solid... you kinda need to start at the beginning to get the full impact on the 4th but it's worth it!